Sing! Choirs | Come and join us in! Find a Choir for you! Singing Pop, Rock and Songs from the Shows! All You Need Is..... Choir! Do You Hear The People Sing?! Contact us for more information! Do You Love to Sing? Everyone is welcome! No Auditions! you can join a choir in Ely, Cambridge or Newmarket! Sing! Choirs provides opportunities for people to sing in a choir regardless of their experience. Starting with one choir in 2011 there are now 4 choirs that meet each week with over 250 people in total, as well as numerous other "Sing!-ing" projects happening. Choirs are open to all ages and no previous experience is needed. 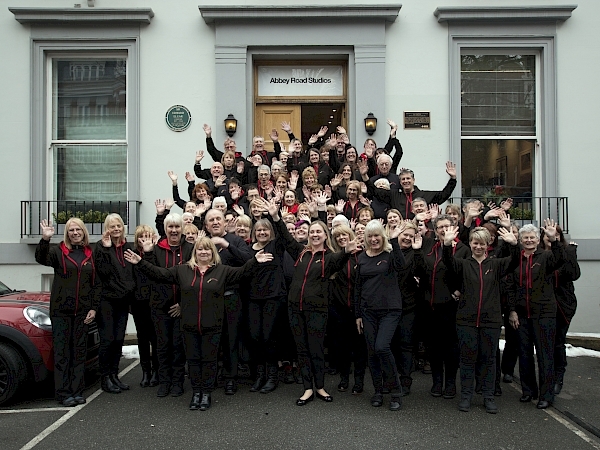 Kathryn directs the choirs which range in size from 40 to 100 members. Find out more about our Musical Director, Kathryn Rowland, here, along with the other programmes of work she is involved with - Music to Grow to and All In Sound. Sing! Choirs are also delighted to support many local charities and over the past few years has raised almost £25,000 for many local causes including All In Sound, Arthur Rank Hospice Charity, Addenbrookes Hospital and East Anglian Air Ambulance, as well as singing at many charitable events. To find out more visit the NEW Frequently Asked Questions and Testimonials pages! Do something for you in 2019! Join a Choir! Just love singing and you will be a welcome member of Sing! Choirs. Singing a great range of pop, rock and songs from the shows, all arranged especially for Sing! Choirs. Contact us now to find out more! Click here! 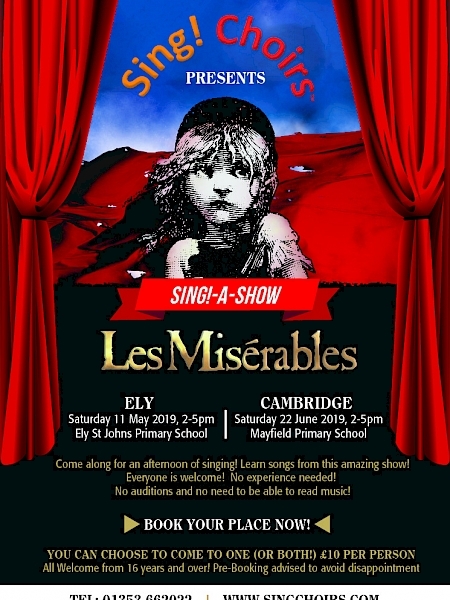 Sing!-A-Show Les Miserables - Booking Now! You definitely will one this afternoon of super singing! Come and join in! Everyone is welcome, regardless of experience.